If you’re planning a trip to paradise but don’t know what to wear or bring, we’ve got you covered! Not only will your outfits be breezy enough for those hot summer days, but you’ll look stylish. Our Pebbled Stretta handbag pairs perfectly with a maxi dress and dainty jewelry. Pack lightly with the help of this bag! It’s small enough to hold essentials like money, sunglasses, chap stick and more. If holding our bag like a clutch isn’t your thing, then our optional chain strap would be a preference. With a chain feature and dainty jewelry your bound to be glowing. Our Paradise Blue Getaway bag is the perfect beach bag. With a shoulder strap feature, trips to the beach become that much easier. Carry a speaker, water bottle, sunscreen, and this conveniently sized bag. With an illuminating bag like that you’ll always be able to find your belongings instantly. 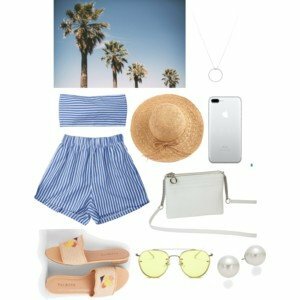 When it comes to hot days along the beach or walking along the pier, two-piece play suits are light weight and look stylish. Upscaling your look is easy with a straw hat and our white double zipped bag. With a double zipped feature, essentials can easily fit in the bag. Let us know in the comments below which outfit you’d wear on a trip to paradise!